On January 1st, 2012 Caterpillar, Inc locked out 465 workers at Electro-Motive, its London, Ontario locomotive plant, after offering a contract that would cut workers’ wages & benefits by more than half (to approximiately $16.50/hr). Picket lines have been set up (photo), a long lockout is expected, and there are indications that Caterpillar is simply using this situation to both break the union (Canadian Auto Workers Local 27) and move the plant to Indiana (home of the pending ‘Right to work’ legislation). On Saturday January 21st, 7,000 – 10,000 people rallied in London is support of the Caterpillar workers (photos). Here are a few talking points of background on Caterpillar, as well as some info on the Canadian Government’s role. I aimed to make this into a brief snapshot of the company, so I’ve added many links throughout for further information. Current CEO’s pay: Doug Oberhelman received a $10.4 million compensation package of salary bonuses, stocks and options as the new CEO in 2010. Former CEO’s pay: Former chief executive Jim Evans’ 5-year compensation totalled $43.2 million (he left in 2010). 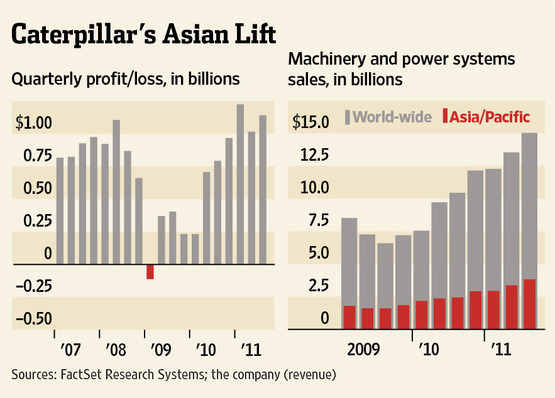 In 2010, Caterpillar’s top 8 executives were paid $67.6 million. On March 19th, 2008, Prime Minister Harper went to the Electro-motive plant to announce a $5-million federal tax break for the company (as part of $1billion in tax breaks for industry in general). Less than 3 years later, they are are looking to cut wages in half and threatening to leave Canada. Harper is now conspicuously silent on the issue. Illinois 2011: Relocation of Caterpillar’s Headquarters? Caterpillar was upset about changes being made to Illinois tax and regulation policy, including a new corporate tax hike. It was also pushing for changes to the state’s workers’ compensation law. This prompted Caterpillar to follow it’s tried and true method of ‘negotiation’, this time threatening relocation of their headquarters. Caterpillar CEO Doug Oberhelman wrote Illinois governor Pat Quinn as follows: “Before, I never really considered living anywhere else and certainly never considered the possibility of Caterpillar relocating. But I have to admit, the policymakers in Springfield seem to make it harder by the day.” Oberhelman later said Caterpillar wasn’t planning to leave Illinois, that he was just trying to ‘spark discussion’. In 2010, Caterpillar received an $8.5 million subsidy to open a plant in Texas through the Texas Enterprise Fund, created by the Texas Legislature at Governor Rick Perry’s urging. Peter Holt, Texas owner of the largest Caterpillar dealerships in the U.S., had contributed over $420,000 to Perry in the previous years (his second largest contributor). As a foreign company buying a Canadian firm, Caterpillar’s 2010 purchase of Electro-motive was automatically reviewed under the Investment Canada Act. The Investment Canada Act “requires consideration of a “net benefit” to Canada when approving foreign takeovers”. The Harper government has yet to disclose the terms of the purchase. ***It’s important to avoid reactionary and ill-conceived division between ‘good’ Canadian companies and their ‘evil’ foreign counterparts – net benefit should be considered regardless of a company’s national origin. Nevertheless, this more limited ICA process exists in Canada, and it needs to be called to account.